Not one to do things by halves, InFocus revealed an interesting new look for its projector line-up at this week's CEDIA expo. The 'still in pre-production' SP8602 made its debut at the show and is a bit of a beast. Forgoing InFocus' usually curved design the heavy duty projector is 1080p (16:9), has a native contrast ratio of 5,000:1 and dynamic black contrast ratio of 20,000:1. The model will also come completed with horizontal and vertical lens shifting and has 1400 ANSI brightness (video optimised). Specs-wise that's all we know about the model – rumour has it, it wasn't even meant to be at the show – but we do know that the SP8602 will be out in August in the US and will arrive in the UK soon after. 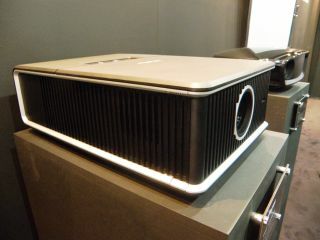 If you don't like the colour scheme which was shown at CEDIA, then do not fret, as the projector can be re-skinned for your liking. Well, if your liking is lacquer, wood effect or matte. Price-wise, you will be looking at £3,000.